Mapco Gas was established by Michael Anthony Podrasky (MAPCO) in order to supplement his teaching salary which in the early 1960 was minimal as the year progressed, business also progressed. The area covered ranged from Forest City, Scranton, Dalton, and Clarks Summit including all the surrounding lakes, which had summer tenants. Today Mapco is run by Michael's son Thomas, who has added Pleasant Mount, Moscow, and Mt. Cobb. Installing new heaters, cleaning space heaters, and converting stoves. OUR PRICES ARE FAIR ALL THE TIME!!! 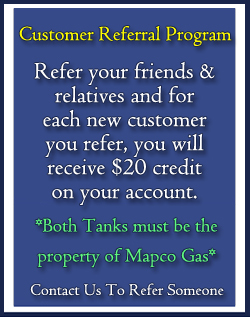 Mapco gas is a small family owned business, our overhead is low so we can pass the saving on to our customers, we know what it's like to make ends meet so we treat all our customers like family. We have budget plans and pre buy plans available. CALL TOM or BEV TODAY and join our growing family, if your interested in saving money on every delivery. Not just the first delivery, remember the propane supplier owns the tank and once it's on your property they can charge you any price they want.